Having a celebrant led wedding in the UK really is one of the most incredible ways to personalise your special day and bring your wedding story to life. Although it is becoming increasingly popular in the UK to have a celebrant led wedding, it is likely that many of your guests will not be familiar with the vast array of ceremonies a couple can have during their highly personalised service. We work with celebrants like Knight Ceremonies to capture the essence of the day and we incorporate this into your very own Wedition, the most incredible way to ensure your story is not only told but cherished forever in this remarkable keepsake. Having Wedition at your wedding is the perfect way to tie together all the aspects of your wedding in one beautiful keepsake. Use Wedition to combine your wedding essentials such as your order of the day, readings and menu as well as to highlight the importance of your celebrant led UK wedding and the meaning behind your chosen ceremonies and rituals: whether it be hand fasting; ring warming; creating a time capsule; or exchanging love letters. You may also like to use Wedition to introduce your wedding party (a fabulous ice breaker); remember lost loves ones with an ‘in memory of’ page; include the history of your venue; and the story of how you met to how you got engaged. Have within it your all-time favourite couple’s photos and it’s also the perfect way to let your pet be part of your day by letting them write an article about what they plan to get up to whilst you are getting married (don’t worry, Liz will help them to write this!). All this, and more styled to your wedding colour scheme and theme making Wedition seamlessly fit into your day yet be the one element that ties everything together in one magical keepsake to be cherished forever by you and your guests. 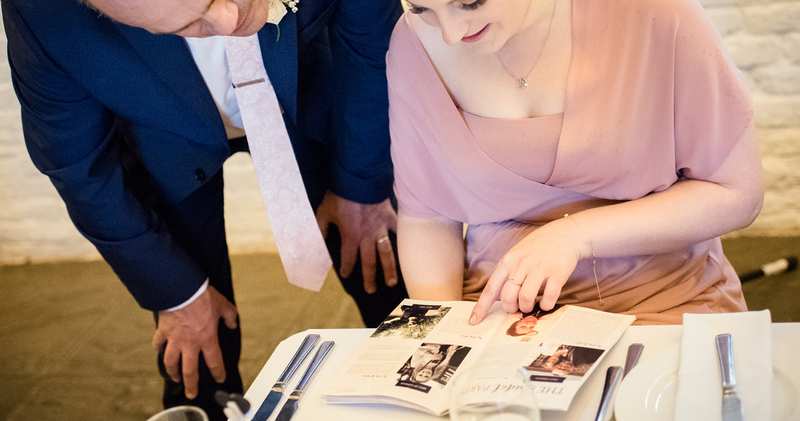 I find that couples who choose to have their ceremony conducted by a UK wedding celebrant have a big story to tell, this is why it is so important for them to have the most personalised ceremony available. A huge part of the wedding celebrant’s job is in fact very similar to mine, we both will want to sit down with you, get to know you, and hear your story. Knight Ceremonies are well renowned for their wonderful personal ceremonies and their warm and captivating delivery style, and they weave lots of lovely details about their couples into the ceremony - they tell your story. It is important to us that you relive your journey together as a couple and let us know all of your highs and lows, the big things, as well as those small details that in essence make up your togetherness. Knight Ceremonies will then write a bespoke ceremony for you, and together we will then set about piecing together your story and creating a keepsake that you will give to your guests and allow them to play a bigger part in your wedding story. 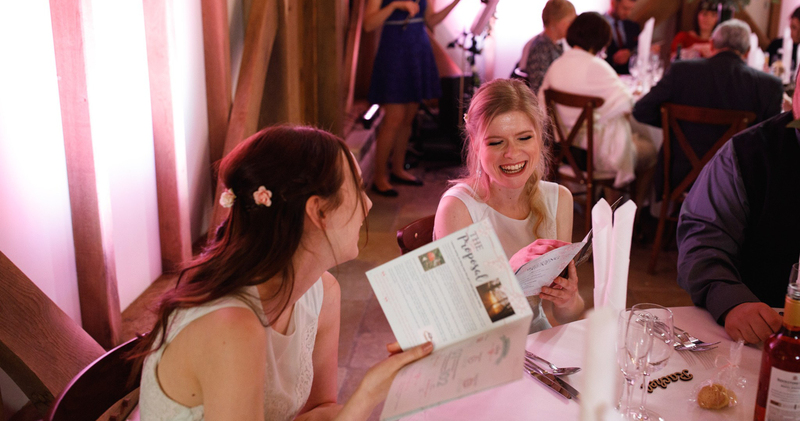 Within your Wedition, you will be able to explain in more detail to your guests what a wedding celebrant is, how important it is for you to tell your story with this bespoke service and why you chose to have a UK wedding celebrant. 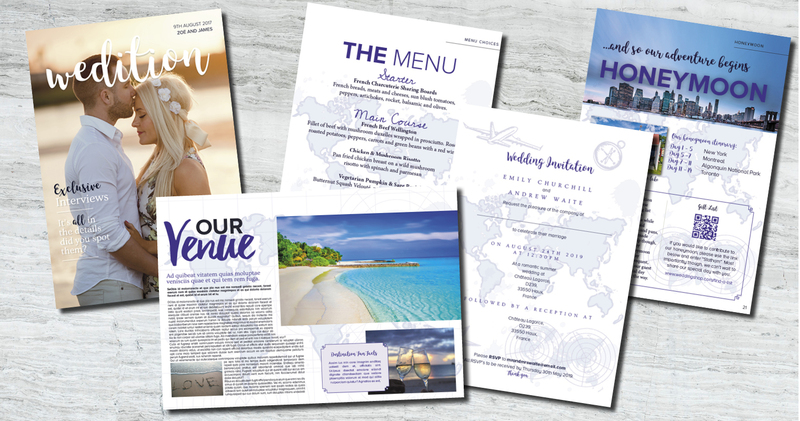 Whether your destination wedding is in the UK because you are a visitor from overseas, or whether you choose to tie the knot in another country and take a UK wedding celebrant with you, your Wedition will be the perfect invitation solution to your destination wedding. Not only can you use Wedition to highlight your story and wedding day details, but it will prove an invaluable guide to tie your cultures together. Perhaps there will be traditional elements from a British wedding that you wish to include which overseas guests may not be familiar with - having a toastmaster for instance, or you may wish to tie in traditional elements from the country you are marrying in or to combine the cultures you are uniting your families with. All these traditions can be explained in advance to your guests, allowing them to feel confident when attending your wedding which perhaps may be different from one they have experienced before, it will also be a chance to let them know wedding etiquette they perhaps might be unaware of. As well as details like this, you may wish to include hotel information, airport/transfer details and times, menu choices, gift list information, a handy guide to the local area and a timeline of the wedding day, ensuring your guests have all the information they need to know ahead of your day means there will not be a torrent of last minute questions in the days leading up to your wedding. There are a huge variety of ceremonies that your UK wedding celebrant can provide. You may choose a ring warming ceremony; hand fasting or you may wish to jump the broom; include a Sugar Rubbing Ceremony, or a Sri Lankan Lamp Lighting ceremony! For many of your guests, it will be the first time that they will witness one of these ceremonies, and with Wedition, it is a nice way of revisiting afterwards, the details that the celebrant will have delivered for you during the ceremony. 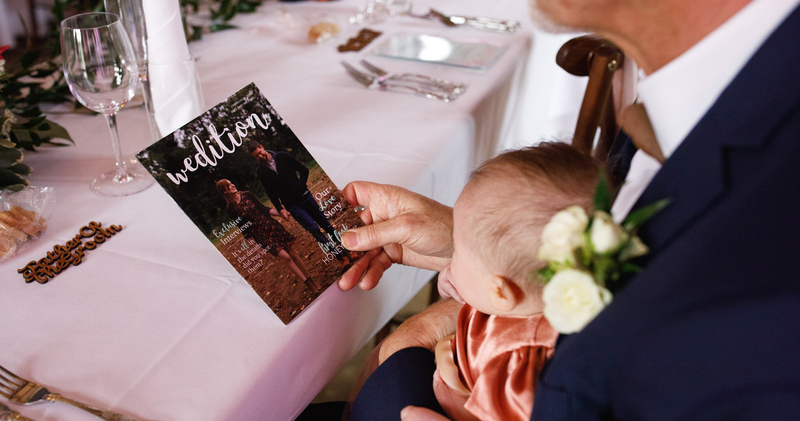 You can ask your celebrant to provide an article that we can include inside your Wedition, it can detail your chosen ceremony and explain the meaning and sentiment behind it. This will also help your guests explain your ceremony to their friends after your wedding day. So much happens on a wedding day, it is easy to forget the finer details, but having Wedition means they will always remember. 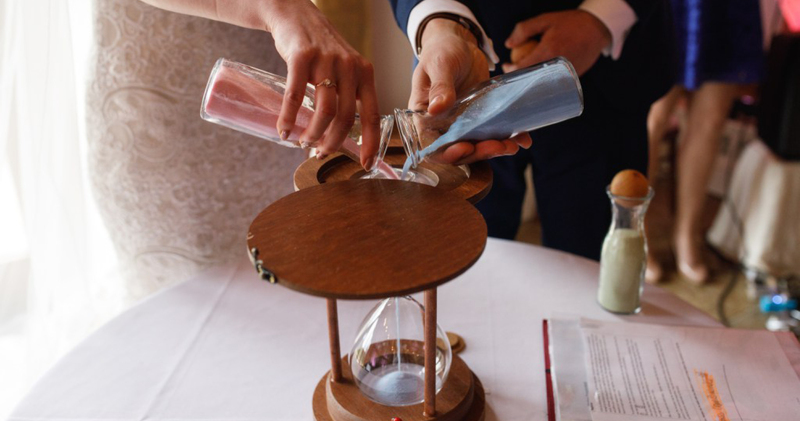 Perhaps you have chosen a sand ceremony as Wedition couple Amy and Mike did, you can use your Wedition to explain to your guests that you have chosen two different coloured sands, maybe your favourite colour, and your partner’s favourite colour. You will then pour the sand into one glass container, symbolising that your hearts and lives are now entwined forever because it will be near impossible to separate the sand back into two separate colours. You may choose an hourglass to represent always having time for each other, or perhaps the container is one that you chose together whilst on holiday. It is stories like this that your guests will love to be able to remember and share with others in future conversations. Get in touch with Liz to arrange your Discovery Session and share the story of your ceremony with your guests in a way they will remember forever!